Before reading, you should know…I LOVE BROWN SUGAR! This may sound weird (probably because it is), but when I was little and I wanted a snack, I would sneak into our pantry and eat spoonfuls of brown sugar. So mom, if you’re reading this…sorry I ate all your brown sugar. Seriously though, it’s so good. My love for brown sugar means that I also love anything cooked in brown sugar. And this chicken is no exception. 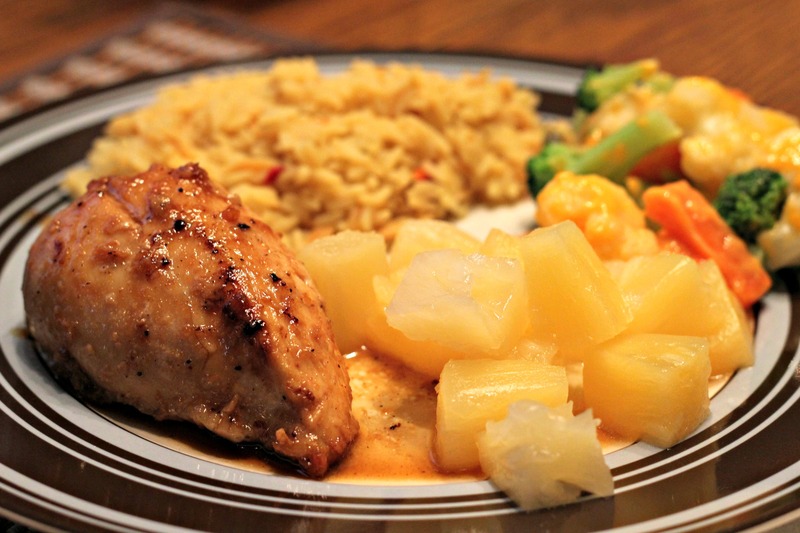 The sugar just melts over the chicken to form a delicious sweet glaze. It’s also very nicely complimented by some pineapple. I had always heard of brown sugar and apple going well together, but never pineapple. Well I had been missing out, because they really go great together! This recipe comes from the healthy-eating folks over at Spark People and has only 166 calories and 8 grams of fat. That’s amazing! If only all diet-friendly meals could taste this sweet and delicious, America’s obesity epidemic would be cured. It’s that good. This is also another great weeknight meal because it only takes about 30 minutes! Melt the butter in a skillet over medium heat. Brown the garlic in the butter. Add chicken breasts to garlic and butter and cook thoroughly, adding salt and pepper as you like it. To serve, spoon remaining sauce in the skillet on top of chicken. Thanks Sinead! I hope you enjoy it as much as we did! Do you think this could be crockpotted?? Ummmm I really don’t know! I know that anytime I’ve made chicken in the crockpot, it shreds really easily, so that would definitely change. Also, brown sugar melts and then hardens, which would be a pain to clean out of your crock pot! If you added some liquid (like maybe apple juice?) in with it, it might work out. If you give this a try, please let us know how it turns out! I know that brown sugar and chicken in a skillet is amazing. I would definitely try this. Thanks for your great recipes! Loved it! Used chicken thighs instead of breasts. Added the pineapple, very good. Thanks Tina! Glad you liked it!